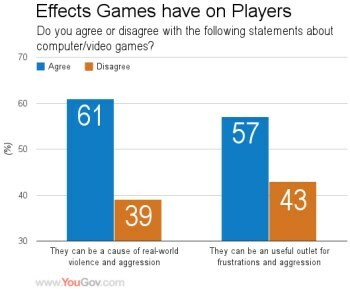 The YouGov poll indicates that "older" Britons are far more likely to believe in a connection between videogames and violent behavior, while younger respondents see it as a "useful outlet" for aggressive urges. A recent poll conducted by YouGov in cooperation with Dr. Andrew Przybylski of the Oxford Internet Institute indicates that 61 percent of U.K. respondents "with an opinion on the matter" - which is to say, those who did not respond to the question with "neither" or "I don't know" - believe that videogames "can be a cause of real-world violence and aggression." It's a disheartening number, given the complete lack of evidence to support any such connection. Digging a little deeper, however, it becomes clear that that opinion is far more likely to be held by people aged 60 or more - 79 percent - than by young adults. Looking at it from the opposite end, 73 percent of respondents aged 18-24 agreed that games "can be a useful outlet for frustrations and aggression," while only 49 percent of people aged 60 or older shared the belief. Females were also far more likely than men to agree that games can cause violent behavior, while those who reported having no experience playing or watching violent games being played were more than five times more likely to believe in a connection than those who are familiar with them. It's not a terribly surprising gap, ignorance being rather well-known for leading to fear and mistrust, and it's also worth mentioning that aggression and violence aren't the same thing and don't even necessarily share a connection. Regardless (and also unsurprising), the study suggests that the "mixed views of electronic games" will fade with time and their growing ubiquity. "This ambivalence might be temporary as the population at large becomes more familiar with games," it concludes. "It is possible that concerns about games could fade away in much the same way that fears about rock music, comic books, and radio dramas dissolved when these forms of entertainment gained wider acceptance."